This is a substantial waffle. A waffle’s waffle, if you will. Kind of homey and wholesome, what with the whole wheat, walnuts, and a touch of olive oil. Leave the figs and walnuts in larger rustic pieces for hearty bites. They’re perfect for brunch, of course, but they’re also great to slice and toast and cut into triangles to eat on the go. The bursts of figgy sweetness mean you don’t even necessarily need maple syrup. An added bonus is that they smell like a Cinnabon while cooking! If your figs are old and dry and have seen better days, use hot water to plump them up. You can do it one of two ways – boil some water and pour the hot water over the figs (in a bowl of course) and let them sit for about 10 minutes. Or, a quickie method is to cover the figs in water and microwave for about 45 seconds. I call that the “Instaplump™” method. And as always, waffles freeze great! Wrap in plastic and freeze for up to 3 months. Just toast when ready to eat. Measure milk out and add the apple cider vinegar, set aside to let curdle. In the meantime, combine flour, baking powder, cinnamon and salt in a large mixing bowl. Add the flax seeds to the milk and mix vigorously until frothy, 30 seconds to a minute. Add mixture to the flour along with water, olive oil, maple syrup and vanilla. Mix with a wooden spoon until mostly combined then fold in the figs and walnuts until all ingredients are moistened. Preheat waffle iron and let the batter rest. Cook according to waffle iron directions, spraying the waffle iron liberally with oil or cooking spray between each waffle is made. Garnish with extra walnuts and fig halves. Isa, do you have any recommendations for a waffle maker – particularly a Belgian? Thanks! These look yummy 🙂 Little bit of confusion here though…do you mean use DRIED figs or fresh ones? Sorry, I’m probably being really silly. No you’re right to ask! They are dried figs. I will update. Oh. My. Lord. Hot damn! I’m glad I found these. I was just looking for a waffle recipe this morning. I will try these tomorrow. I added frozen blueberries instead of figs (I didn’t want to run out to the store on this freezing cold Chicago morning) and they were DELICIOUS! I definitely want to try them with the figs though. We made these this morning. The store only had Turkish figs, but the waffles were awesome and hearty. Yum! Made these this morning, thanks! We used 1/2 Cup whole wheat flour and 1 1/2 cup all purpose (King Arthur), and I would definitely add blueberries to round it out like Andrea says above ^ So good and so filling. I could only eat 1 and 1/2 waffles! If you don’t have pure maple syrup, you can substitute fake syrup, but also add some brown sugar or it won’t be sweet enough. Yum. I think that blueberries would be overkill, not sure how that would round em out. I mean, they’re good instead of figs but not in addition to. But I’m happy you liked them! These look absolutely delicious! Upon reading this, I realized that I haven’t had a single waffle since becoming a vegan. That needs to be rectified! 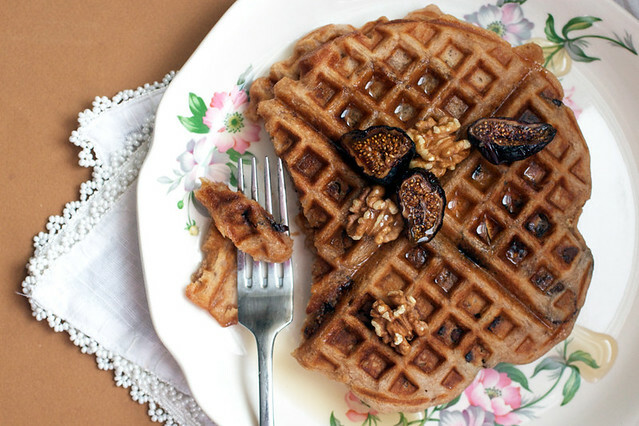 Figs and walnuts in waffle form?! YUM. If I don’t have a waffle iron (eeek), will these work as pancakes or are the batter consistencies too different? It’s too thick, I think. Just take your normal pancake recipe and add some figs and walnuts! Or give this a shot and let us know what happens. This has to be my favorite waffle recipe, because it has cinnamon. I can’t tell the exact moment when I became I cinnamon fan, but the important thing is that I am. So thank you for this recipe. gluten free version? don’t mean to be a fussy eater but you know…. I made these a week ago and they were divine. My bf, who is not vegan (yet), absolutely loved them. Waffles are awesome! Thank you for the recipe. More waffle recipes, please please please! The perfect food, one that freezes well, good for breakfast or supper. For the commenter who needed a waffle iron recommendation, I have had the Presto waffle iron for a while and it makes really tasty waffles. I haven’t ever owned another make of waffle iron, though, so I have no basis for comparison. Question- can I sift and use regular whole wheat flour if my supermarket doesn’t stock the pastry kind? Just fantastic. What a pleasure to make and eat a delicious Sunday morning breakfast that feels decadent but doesn’t then make me feel like a complete slug for the rest of the day. House smells amazing, too! I made these for my daughter’s fourth birthday yesterday (minus the figs), they were wonderful! We got a waffle maker for Christmas and I have been experimenting with different recipes, this was my families favorite so far. Thanks! I know this may sound odd, but can you use regular milk? I know that defeats the purpose, but I’m allergic to soy, rice, and almond milk, but I am really trying to make eggless waffles, and this sounds like an amazing recipe, so is it possible??? Thanks. These were delicious but they stuck like crazy to my Belgian waffle maker despite using cooking spray on waffle maker before each waffle. I also followed recommended temperature setting for my waffle maker. Any suggestions? Thanks. We use only gluten free at Adytum (www.adytumsanctuary.com) and I’m wondering if anyone’s tried this w/ Bob’s Red Mill GF All Purpose flour? These were really yummy! We are on a waffle phase in my house and we made your chocolate brownie waffles this morning. My 5 year was in love! I just made these this morning and they were wonderful! Just a note for others: if you use fresh figs, you’ll want to reduce the water by about a half. I also substituted about a third of the flour for spelt, and the waffles came out fluffy and delish (sometimes if you use too much spelt, the gluten is too low and the baked item will be too dense). But that amount of spelt worked well. The warm gooey figs and crunchy walnuts were a perfect combination! The waffles were soggy and not crisp. I left them for about 5 MIN in the Belgian waffle maker. Any recommendations? Absolutely fantastic. I subbed blueberries for figs and fed 6 people with the suggested quantities. Hurrah for the PPK! These are delicious, for sure, but I started making the again without realizing that I was out of flax seeds…..can I substitute something or do without them? they’ll be my first vegan waffles, too! and as tasty as blueberries are, i don’t know what you folks are thinking..I’m gonna follow the recipe as is- sounds poifect! just made your waffles and they actually taste quite nice but they have sort of a bitter aftertaste. I am new to cooking and baking but my mother in law suggested it might be too much baking powder? Do you think that might be possible? PS: I love your website, I already tried 5 different recipes and they all turned out great! Today I am going to order 2 of your cooking-books! Hi there, Yes baking powder overload will make things metallic tasting, but I’ve made this recipe a million times and never had that problem. Was it possible you used baking soda instead? Otherwise, I’m not sure! Sometimes stale flour can be the problem, too. Or even just mismeasuring a bit. Thanks for the love, I hope that you’ll try these again and that they come out well for you. Made these for a friend who came over for brunch. VERY nice. I couldn’t find figs at the supermarket so I subbed chopped up pieces of date and they tasted like candy bits in the waffle. I love that the walnuts make up a big part of them too– means that they stay with you longer than many vegan breakfast foods. The dates and maple syrup made them sweet enough that I didn’t want to put more syrup on and I am a sugar fiend. 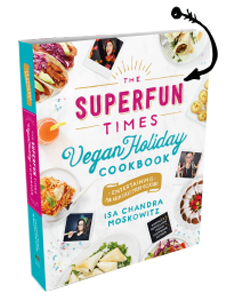 Thank you again for such fantastic recipes!! Ha! Perfect! I’m thinking of making these for Valentine’s Day for my husband, but he doesn’t care for figs in any form, so I was wondering if anyone had used dates. Perfect! These were fantastic! We did not have figs or walnuts, so I subbed dried apricots and almonds and used 3/4tsp vanilla and 1/4 tsp almond exracts. I also used 2T oil instead of 3 and the waffles were still light and crispy. Yum! These worked… Way down in Colombia! Thanks! Isa, how would you recommend making these gluten-free? They look delicious!! Your description of these waffles is spot on! Before this morning I had not ever cooked with figs before. They are so delicious in a waffle-and SO filling. Thank you for yet another amazing recipe! Made these for dinner, with pecans instead of walnuts. Decadent, filling, hearty…perfect for a rainy night when i didn’t really feel like cooking. I made these with 2 cups of my standard gluten free flour mix (ratio: 2 c brown rice flour, 2/3 c potato starch, 1/3 c tapioca starch) and added about 3/4 t xanthan gum and they turned out fine. Probably a little denser than those made with regular flour, but still very tasty. Thanks! I used 4tbs sunflower oil instead. I never make substitutions to your recipes but this worked out amazingly. Dad ate them and then lamented at the fact that they can’t be stored, if I were to make a big batch say…BUT THEY CAN FATHER in the freezing machine! He was thrilled. Turned out great, as I expected based on other recipes from your website that I have tried. I made an error and did not add the water (saw the 1/2 cup sitting on the counter, when the first waffle was in the iron!). Even with the minor Oops, they were great. Love the warm fig (used Calimyrna figs, from Costco) and there were super yum! Based on my experience with your awesome blueberry oatmeal waffle recipe, I turned my waffle iron up to med-dark and they cooked just fine, though take awhile, well worth the wait!! I can’t hardly wait to try this it sounds so delicious. Can I simply just say what a comfort to discover an individual who truly knows what they are talking about on the internet. and understand this side of the story. I was surprised that you are not more popular since you surely possess the gift. I thought figs were not vegan due to the wasp/fig relationship. Or is it down to personal judgement – Can you clarify this for me please?